I think I have a new vision, a one page dungeon that can be played solitaire or refereed. I like what the One Page Dungeons process attempts to create. To me it is a simple adventure outline and a quick playing, one evening experience. I don't know about you, but that's about all the time I can give to my gaming habit right now. 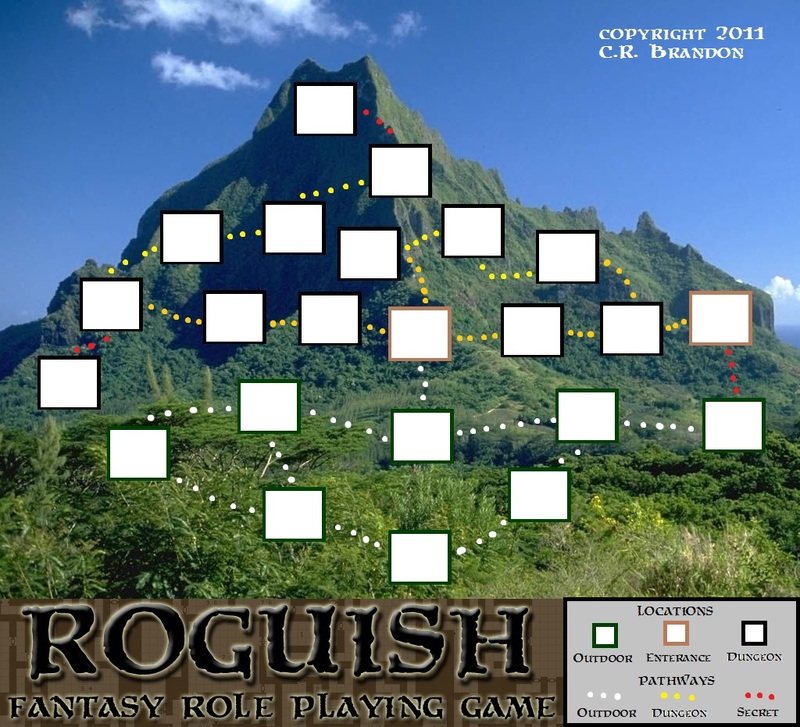 Mashing up that paradigm with a new board game, I see a brainstorm of an idea for ROGUISH RPG. 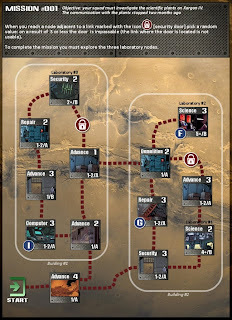 The maps/adventures for Space Infantry are contained on one graphical page. You assemble (build) your squad and go from node to node overcoming the challenges and try to complete the mission. 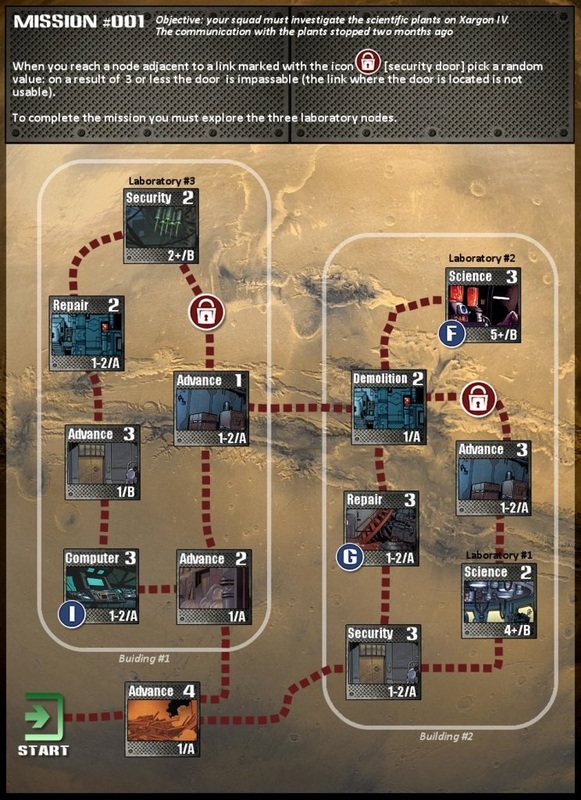 In Space Infantry Nodes have a specific event or challenges to be overcome before being able to move on, and most have a chance for a random event/encounter. For example one node may list "Climbing" as the challenge and 2 as the number of times it must be successfully completed before being able to move on. Your character with a "Climbing" skill must successfully twice overcome it before the squad is able to move on. If no one has climb skill then you have to get a 6 or better twice before your group can move on. Each node is a location like a dungeon room, or an encounter outdoors, or a trap or other challenge to be overcome! You could build a party of adventurers and attempt to go through it solo, or if you would rather, you could referee the adventure for a group of players. Each location has a challenge (Climbing, tracking, trap, encounter, etc.) and a potential random event. I have ideas for symbols and numbers representing challenges, encounters, magic. etc. In addition paths would be color coded: white is used for outdoors or open air, yellow for underground requiring torchlight and red for secret passages. The locations themselves are color coded too: Green for outdoors (jungles/forests), brown for entrances/exits/buildings, black for dungeons/underground, and navy blue for sea/river locations. Using colors to denote information is simple, effective, and instantly understood. Setting this upon a graphic instills a sense of the quest or adventure locale giving flavor without reams of text. Whether played as a solo or refereed you have to build much of the narrative but much like any Roguelike, that's part of the fun and expectation! The experience in playing, failing or overcoming challenges will create a narrative for players and referee alike. Below is an quick and dirty example of what I envision for Roguish RPG adventures.